Muslim publics around the world increasingly reject suicide bombing and other forms of violence against civilian targets in the defense of Islam. Overall, majorities in 15 of 16 Muslim publics surveyed say that suicide bombings can be rarely or never justified. Fully 77% of Muslims in Indonesia – and nearly as many in Bangladesh, Pakistan and Tanzania – say that such tactics are never justified. This year’s first Global Attitudes report showed that the overall U.S. image remains abysmal in predominantly Muslim countries. Notably, solid majorities in every largely Muslim country surveyed – as well as in the Palestinian territories – also say they are very or somewhat worried that the U.S. could be a military threat. 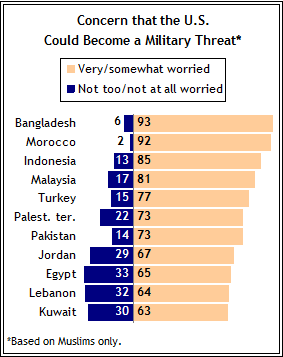 Concerns are greatest in Bangladesh, Morocco and Indonesia, but even in Turkey – a NATO ally of the United States – 76% are worried that the U.S. could become a military threat to their country. The survey also finds that, amid continuing sectarian violence in Iraq, there is broad concern among Muslims that tensions between Sunnis and Shia are not limited to that country and represent a growing problem for the Muslim world more generally. Fully 88% in Lebanon and 73% in Kuwait – and smaller majorities or pluralities of Muslims elsewhere in the Middle East – say that Sunni-Shia tensions represent a growing problem for the Muslim world. Only in countries far removed from the region’s strife – such as Indonesia and Senegal – do most Muslims believe that Sunni-Shia tensions are limited to Iraq. Saudi Arabia and its leader, King Abdullah, are well regarded in most predominantly Muslim countries. Afghanistan’s pro-U.S. president, Hamid Karzai generally inspires less confidence, although he is an unfamiliar figure in many countries. In neighboring Pakistan, only about a quarter (23%) say they have a lot or some confidence in Karzai to do the right thing in world affairs, while many Pakistanis (42%) decline to offer an opinion of the Afghan leader. Opinion about the radical Palestinian Sunni group Hamas varies widely among Muslim publics, and this also is the case with views of Hezbollah, the Lebanese Shiite movement. Palestinians express largely favorable opinions of both groups. Support for suicide bombing and similar extreme terrorist tactics has fallen since 2002 in seven of the eight countries where trend data are available. In Lebanon, the proportion of Muslims who say suicide attacks are often or sometimes justified fell from 74% to 39% between 2002 and 2005, and stands at just 34% today. Just 9% of Pakistanis believe suicide bombings against civilian targets can be justified often or sometimes, down from 33% in 2002 and a high of 41% in 2004. And in Jordan, acceptance of suicide bombings grew from 43% to 57% between 2002 and 2005, but has dropped to just 23% today. The pattern is equally stark among Muslims in Bangladesh and Indonesia, where support for suicide bombing as a tactic in defense of Islam is down by at least half since 2002. Changes have been more modest among Muslims in Africa. In Tanzania, the share of Muslims who say suicide attacks are often or sometimes justified dropped to 11% from 18% in 2002, and 42% of Nigerian Muslims believe suicide bombings can be justified, down only slightly from 47%. But the share saying such attacks are “never” justified has risen from 26% to 39% in Nigeria. In Turkey, opinion has been more stable. Since 2002, fewer than one-in-five Turks has approved of suicide bombing; currently just 16% believe the tactic can be justified often or sometimes. But support for suicide bombing is widespread among Palestinians: 41% say such attacks are often justified while another 29% say it can sometimes be justified (no comparative data from 2002 are available). Only 6% of all Palestinians say it is never justified, by far the smallest proportion in any Muslim public surveyed. Acceptance of extreme terrorist tactics in the Palestinian territories is remarkably uniform across major demographic groups, including roughly equal proportions of men (44%) and women (38%), Palestinians under the age of 30 (41%) and those 50 years old or older (47%), as well as among those who are the most committed to Islam (38%) and Palestinians who are less religious (45%). Pockets of significant Muslim support for suicide bombing also are found in countries outside the Palestinian territories. While a majority of Muslims in Mali (53%) say suicide attacks are rarely or never justified, 39% believe such tactics are often or sometimes acceptable, a view shared by substantial minorities in Nigeria (42%) and Lebanon (34%). In both Lebanon and Nigeria, higher proportions of Shia Muslims than Sunnis view suicide bombings as justified. Shia in Lebanon are nearly three times more likely than Sunnis (54% vs. 19%) to endorse suicide bombing. In Nigeria, 60% of Shia say the tactic is often or sometimes justified; this compares with 43% of Sunnis in Nigeria. 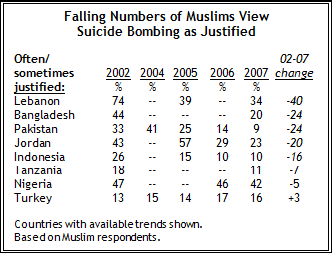 Few consistent demographic patterns emerge in Muslim attitudes toward suicide bombing. In Turkey, those older than 50 are more likely than those younger than 30 to say such attacks are never justified (65% vs. 50%) while in Bangladesh, it is young Muslim adults who are more likely to reject the tactic (79% to 68%). Elsewhere, there are no noteworthy differences between the old and young Muslims. Similarly, men are more likely than women in Turkey to say terrorist acts against civilians are often or sometimes acceptable (20% vs. 12%) while in Nigeria, a substantially larger proportion of women (49%) than men (36%) men say suicide attacks could at least sometimes be justified. The marked decline in the acceptance of suicide bombing is one of several findings that suggest a possible broader rejection of extremist tactics among many in the Muslim world. In many of the countries where support for suicide attacks has fallen there also have been large drops in support for Osama bin Laden. 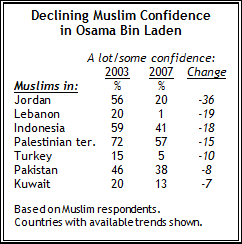 For example, the percentage of Jordanian Muslims who have confidence in bin Laden as a world leader has fallen 36 percentage points since 2003 while the proportion who say suicide bombing is sometimes or always justified has dropped 20 points. (For a more detailed analysis of opinions about bin Laden, see Global Unease with Major World Powers , released June 27). Substantial numbers of Muslims throughout the Middle East believe tensions that between Sunnis and Shia in Iraq reflect a growing problem throughout the Muslim world. Fully 88% of Muslims in Lebanon, and solid majorities in Kuwait, Jordan, the Palestinian territories and Egypt say these tensions are not limited to Iraq and are a larger problem for the Muslim world. However, these concerns are not shared as widely in Asian countries with large Muslim populations. Only about three-in-ten Muslims in Malaysia (31%) and 23% in Indonesia see Sunni-Shia tensions as extending beyond Iraq. However, two-thirds of Pakistani Muslims (67%) say the violence in Iraq reflects broader problems between the two largest branches of Islam. In Africa, more than half of Senegalese Muslims (52%) say the sectarian tension is limited to Iraq. Pluralities in Ethiopia and Mali share this view. But Muslims in Nigeria and Tanzania tend to believe that tensions between Sunnis and Shia represent a broader problem. In Muslim countries with sizable Sunni and Shia populations, there are only slight differences between these groups in views of the implications of sectarian conflicts in Iraq for Islam. In Lebanon, for example, nearly nine-in-ten Shia (88%) say tensions between the two groups in Iraq reflect a growing problem for Islam, a view shared by 86% of all Lebanese Sunnis. Similarly, two-thirds of both groups in Pakistan say sectarian violence in Iraq signaled a broader problem, as do slightly more than half of Sunnis and Shia in Nigeria. Large majorities of Muslims in Asia and the Middle East worry that the U.S. could become a military threat to their countries. Muslims in Bangladesh and Morocco are almost unanimous in their concern about the U.S. posing a military threat to their countries someday (93% very/somewhat worried in Bangladesh; 92% in Morocco). In Turkey, more than three-quarters (77%) worry that the U.S. could become a military threat to their country, as do majorities of Muslims in other countries that have close ties with the U.S., such as Pakistan and Kuwait. In both Turkey and Kuwait, concern that the U.S. may emerge as a military threat has grown modestly. Two years ago, 66% of Turkey’s Muslims said they were worried about a possible military threat from the U.S.; today that figure stands at 77%. Since 2003, more Kuwaiti Muslims also express this concern (55% then, 63% today). Conversely, while concern is still high among Lebanese Muslims, the proportion saying they worry about a U.S. military threat to Lebanon has dropped 17 points since 2005 (81% vs. 64%). The belief that the U.S. might pose a military threat varies among people of different faiths in Lebanon and Malaysia. Nearly two-thirds of Lebanese Muslims (64%) worry that the U.S. may become a military threat to their country, compared with 41% of Christians. In Malaysia, Muslims are considerably more likely than Buddhists to see the U.S. as a potential military threat, but a majority of Buddhists also express this concern (81% of Muslims vs. 53% of Buddhists). Afghan leader Hamid Karzai, a key ally of the United States, provokes particularly strong feelings of mistrust in the Middle East and in sub-Saharan Africa, while in Asia judgments of him are somewhat less critical. In the Palestinian territories, Lebanon, Jordan and Egypt, majorities say they have little or no confidence in the Afghan president. Karzai is held in particularly low regard in the Palestinian territories, where 65% have little or no confidence in him to make the right decisions when it comes to world affairs, compared with just 11% who express at least some confidence in him. The Afghan leader is viewed even more negatively in Ethiopia, where 71% say they have little or no confidence in Karzai – the highest level of mistrust recorded in any of the 16 nations where the question was asked. Elsewhere in sub-Saharan Africa, the balance of opinion about Karzai also is mostly negative. Nigeria is the only country in the region where as many as a third express some confidence in Karzai. A majority in Bangladesh (56%) expresses confidence in Karzai to deal with foreign affairs, the only country surveyed where this is the case. In Pakistan, which borders Afghanistan, 23% express a lot or some confidence in Karzai, while 35% have little or no confidence, and 42% offer no opinion. 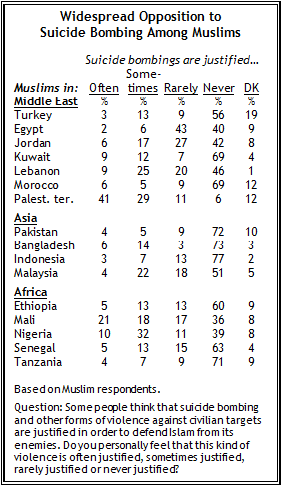 In countries outside the Middle East, Muslims have significantly more positive views of of Karzai than do non-Muslims. For example, 55% of all Muslims in Nigeria say they had a lot or some confidence in Karzai, more than four times the proportion of non-Muslims (13%). In Malaysia, the differences also are substantial: 34% of Muslims and 7% of non-Muslims expressed confidence in him, though pluralities of each group did not know enough about him to have an opinion. 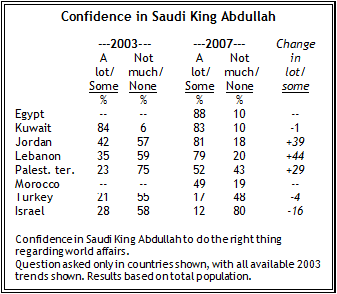 The publics in most predominantly Muslim countries in the Middle East express confidence in Saudi King Abdullah. Nearly nine-in-ten Egyptians (88%) say they trust the monarch to do the right thing in world affairs, a view shared by nearly as many Kuwaitis (83%), Jordanians (81%) and Lebanese (79%). Attitudes are more mixed but still positive in the Palestinian territories, where 52% express a lot or some confidence in Abdullah. In Morocco, 49% say they have a lot of some confidence in the king, compared with 19% who voice little or no confidence. Only in Turkey and Israel do negative views of the king outweigh positive evaluations. Turkey is the only predominantly Muslim country surveyed where feelings about Abdullah tip decidedly negative: About half (48%) say they have little or no confidence in him to do the right thing in foreign affairs, while 17% express at least some confidence. In Israel, critical evaluations of Abdullah outnumber positive views by more than six-to-one. The Lebanese militant group Hezbollah and its leader Sheik Hassan Nasrallah are viewed favorably among the Muslim publics in the Middle East. Opinions of Hamas, the Palestinian Sunni group, are comparable in most of the countries where the question was asked. (For a more detailed analysis of opinions about Hamas, see Global Unease with Major World Powers , released June 27). Hezbollah, whose followers are predominantly Shia, is viewed most favorably in the Palestinian territories, where 76% have a favorable view of the organization. Elsewhere in the Middle East, solid majorities express positive opinions of Hezbollah in Egypt (56%) and Jordan (54%). But the story is very different in Lebanon, where Hezbollah precipitated a military confrontation with Israel last summer. Nearly two-thirds of all Lebanese (64%) have an unfavorable view, including a 55% majority who say their opinion of the organization is very unfavorable. In Turkey, opinions of Hezbollah are equally negative: 66% of Muslims have an overall unfavorable opinion of the group and more than half of all Muslims in Turkey (58%) characterize their feelings as very unfavorable. In Lebanon, views of Hezbollah, as well as Hamas, are deeply divided along religious lines. Fully 85% of Lebanese Shia have a favorable view of Hezbollah, while about as many of the country’s Shia and Christians have a negative opinion of the movement. However, Lebanese Shia also have a more favorable view of Hamas, a Sunni movement, than do the country’s Sunnis. Not surprisingly, views of Hezbollah’s political leader Sheik Hassan Nasrallah closely track opinions of Hezbollah. For example, 79% of all Palestinians have a favorable view of Nasrallah, as do 54% of all Jordanians – proportions that almost exactly match their respective views of Hezbollah. At the same time, two-thirds of all Lebanese (66%) have a negative opinion of him, virtually identical to the 64% who have an unfavorable view of his organization. Throughout the Muslim world, large majorities have a favorable view of Saudi Arabia, the historic center of the Sunni branch of Islam and home to its most sacred shrines, while opinions of Egypt are only slightly less positive. About nine-in-ten have a favorable view of Saudi Arabia in Egypt (91%), Jordan (90%) and Pakistan (87%), whose populations are largely Sunni Muslim. Saudi Arabia also is viewed positively in Lebanon. More than eight-in-ten Lebanese have a positive opinion of Saudi Arabia, including an overwhelming majority of Sunnis (94%) and a smaller majority of Shia (64%). Turks express divided opinions of Saudi Arabia (40% favorable/39% unfavorable). Elsewhere in the Muslim world, substantial majorities have favorable views of Saudi Arabia in Indonesia, the Palestinian territories, Malaysia and Morocco while opinions are mixed in Bangladesh. In Israel, attitudes are overwhelmingly negative: 79% say have an unfavorable view of Saudi Arabia, including 44% who say they have a very negative impression of the kingdom. Similar patterns occur in attitudes toward Egypt. In seven of the 11 countries (other than Egypt) where the question was asked, majorities ranging from 55% in Morocco to 88% in Jordan have a favorable view of Egypt. Opinions divide evenly in Turkey, where 37% feel positively toward Egypt but an equal share does not. In Israel, which shares a troubled border with Egypt, more than three-quarters report they have a negative opinion of Egypt. Iran’s image among predominantly Muslim nations is mixed. Opinions of Iran are significantly more favorable in countries outside the Middle East than they are in that region. In Lebanon, Turkey, and Jordan, majorities say they have an unfavorable view of Iran, and opinions are about evenly divided in Egypt. Most Palestinians (55%) say they have favorable impression of Iran. Elsewhere, substantial majorities in Pakistan, Indonesia, Malaysia and Bangladesh say they have a positive view of Iran. (For a more detailed analysis of opinions about Iran, see Global Unease with Major World Powers , released June 27).